Hyman Aaron "Hy" Lit (May 20, 1934 – November 17, 2007) was an American DJ based in the Philadelphia area from the 1950s until 2005. In his 50-year career, Hy Lit broadcast from WIBG, WDAS/WDAS-FM, WKBS-TV, WIFI, WSNI/WPGR, KPOL, WKXW, among many others. His last station was WOGL, where he broadcast from 1989 until his resignation late in 2005. He was known as "the Jet Jockey on Flight 99" which was the frequency for WIBG. The Broadcast Pioneers of Philadelphia  inducted Lit into their Hall of Fame in 2003. 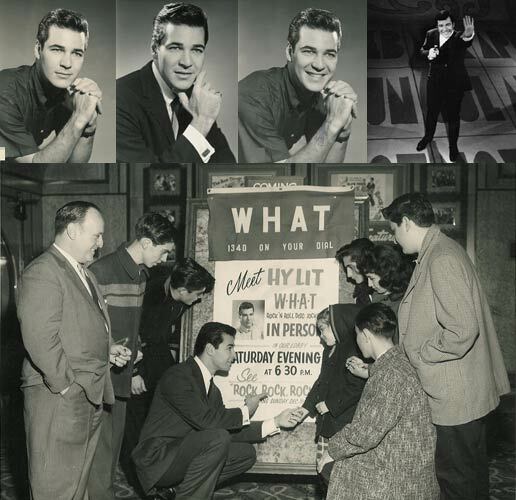 At one time in the 1960s, Hy hosted the nationally syndicated Hy Lit Show from WKBS-TV in Philadelphia, which aired in more than 30 markets nationwide. Lit dominated AM radio from the late 1950s through the 1960s as one of WIBG's "Good Guys," as his Hall of Fame show drew a 71 market share (unheard of before or since.) He released several successful LP "Hall of Fame" collections of music he played on the show, the last of these when he joined WPGR in 1981. Around 1978, Lit moved to California after a brief but successful stint with the Harlem Globetrotters before once more returning to the Philadelphia area. In 1977, when WIBG went off the air forever, Hy Lit was the last DJ on the air. Since 1982, and many years to follow, Lit hosted a live oldies radio show at different area clubs (most notably the Woodbine Inn in Pennsauken, New Jersey), where he'd close his commercials by saying, "I wanna see your face in the place!" Lit moved to WOGL-FM in 1989, hosting the highly rated "Top 20 Countdown" on Saturday and Sunday afternoons in addition to his weekday afternoon shift. Lit was born to Sam and Mona (Kessler) Lit, in South Philadelphia. He shares two children and three grandchildren with his first wife Miriam “Mim” Uniman whom he met while a rising star in Philadelphia. Uniman was a former Miss Universe contestant via being named Miss Philadelphia in 1956 (see reference two). He later married his second wife, Maggie (Russo) Lit. In the mid-1990s, it was revealed that Lit was suffering from the beginnings of Parkinson's disease. Just after the death of Hy's wife Maggie (Russo) Lit in 2000, WOGL and Infinity/CBS Broadcasting management significantly reduced Lit's radio hours, along with a significant decrease in salary. In 2002, a lawsuit was filed with the aid of law firm Spector, Gaddon and Rosen against the media conglomerate, CBS Broadcasting, which for a second and concurrent time decided to reduce Lit's radio time and salary and this time cancel his health insurance. In December 2005, Lit, station WOGL, and CBS Broadcasting settled the three-year health and age-discrimination lawsuit, under the condition that Hy Lit would (reluctantly) retire from the station. Lit did his last Hy Lit Hall of Fame Show radio show on December 11, 2005. However, WOGL management would not permit Lit to reveal he would be leaving the airwaves. Lit died at 12:30 pm November 17, 2007, at Paoli Memorial Hospital of kidney failure. He is survived by his son Samuel Lit, daughter Benna Lit (Martucci) and three grandchildren. He is buried at West Laurel Hill Cemetery, in Bala Cynwyd, Pennsylvania.